While Martelly, a performer-turned-politician, seems almost as if he’s still campaigning for office, dashing from one public event to the next, issues pivotal to Haiti’s prospects for stability and prosperity remain unresolved. Martelly’s administration faces severe short-term challenges, including a looming fuel and food crisis, hurricane season, the start of the school year and a surging cholera epidemic in the countryside. Public investments continue to languish, unemployment hovers above 70 percent, hundred of thousands remain homeless, and the International Monetary Fund has lowered its growth projections for this year to 8.6 percent from 10 percent. Thursday, a week after 28 people died in flooding, Haitians were warned to prepare, yet again, for heavy rains. • Martelly has no government, and the prospects that parliament will approve his choice for prime minister, Daniel Rouzier, are uncertain. • The president has mishandled his relations with the influential Haitian diaspora, the vast population of Haitians living abroad, which had seen his election as a chance for greater influence on their homeland. 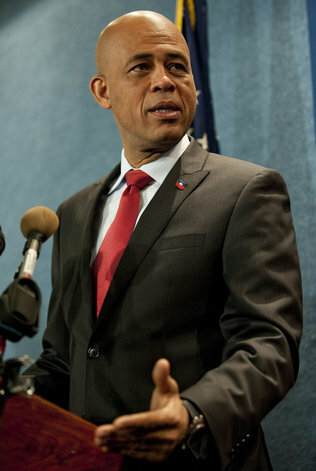 • Martelly’s policy toward the Interim Haiti Recovery Commission, the principal U.S.-backed vehicle for reconstruction, is in doubt, following contradictory statements about its future from his team. The biggest problem facing Martelly concerns his nomination of Rouzier, a 51-year-old U.S.-educated entrepreneur, as prime minister. Despite vigorous lobbying on Rouzier’s behalf by former President René Préval, whose political coalition holds a comfortable majority in both chambers of parliament, Rouzier’s supporters realize his prospects remain uncertain. At the moment, a parliamentary commission charged with reviewing Rouzier’s qualifications is expected to present a report early next week. The commission has raised issues about missing documents and relative technicalities, prompting fear that its members are trying to obstruct the nomination. This has made for a confusing situation fueled by distrust, with Martelly recently going so far as threatening to dissolve parliament.